By the mid-2000s, the King neighborhood of northeast Portland was in the thick of transitioning from a majority non-white and historically Black area to a majority white one. For then-12-year-old Jennifer, even the shifting color of the King neighborhood was still a radical, welcoming, life-changing difference from how she’d grown up. For decades of Portland history, neighborhoods like King had been a bastion of the local Black Portland community, an arrangement not of happenstance but directly due to institutionalized redlining and discriminatory housing policies. Still, Black Portlanders created community where they could, fostering vibrant neighborhoods and civic life. But starting in the 1950s, the city’s myriad urban renewal projects in its north and northeast quadrants systematically dismantled and destabilized Black communities. Decades downstream in the early 2000s, north and northeast Portland became ground zero for gentrification, attracting people and investors from elsewhere with higher incomes, resources and political heft than the average Black resident. Between 2000 and 2010, nearly 10,000 Portlanders of color, mostly Black, moved out of the Portland’s central neighborhoods, including communities like King. Though some moved on their own accord, most were pushed by skyrocketing rents and property prices toward East Portland, where housing costs were relatively more affordable. Jennifer would often follow her friend two blocks out of the way off NE Killingworth, a main thoroughfare in King, to walk past a particular house. Her friend would explain, in almost hushed tones, that it had been her grandmother’s family home. Had. Yet her friend was drawn back to the property, over and over again, with Jennifer in tow. Her friend never spelled out the circumstances of why the home didn’t belong to her family anymore, but the massive displacement King residents had been witnessing—at least those still there to witness it—provided plenty to read between the lines. That sense of home eventually faded as the winds of gentrification caught Jennifer’s family. They moved several times before Jennifer and her siblings went off to college, closer to the city’s outer limits with each subsequent move. Jennifer first went to college at Western Oregon University. There, she gave birth to her daughter, Cambria, and soon transferred to Portland State University. As she approached graduation, she started looking for housing in the city and quickly realized that rents were out of her reach. She and her two sisters eventually found a home in East County. Today, Jennifer and Cambria make their home in a third-story apartment at Charlotte B. Rutherford Place, located in the Arbor Lodge neighborhood, just slightly more than a mile west of King. 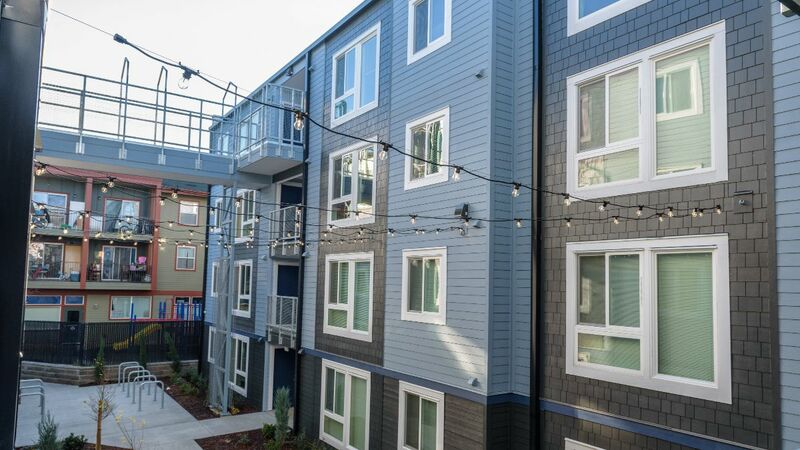 Opened in December 2019, the affordable housing community project figured intentionally into CCC’s targeted efforts to meet the housing and health needs of African Americans. 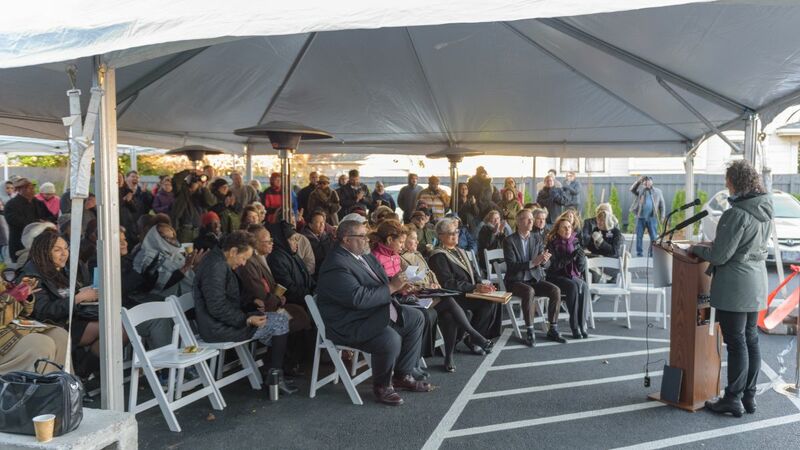 Opened in December 2019, the affordable housing community project figured intentionally into CCC’s targeted efforts to meet the housing and health needs of African Americans. Though there to celebrate, Dr. Solotaroff spoke to the modesty of the effort relative to systemic injustices. 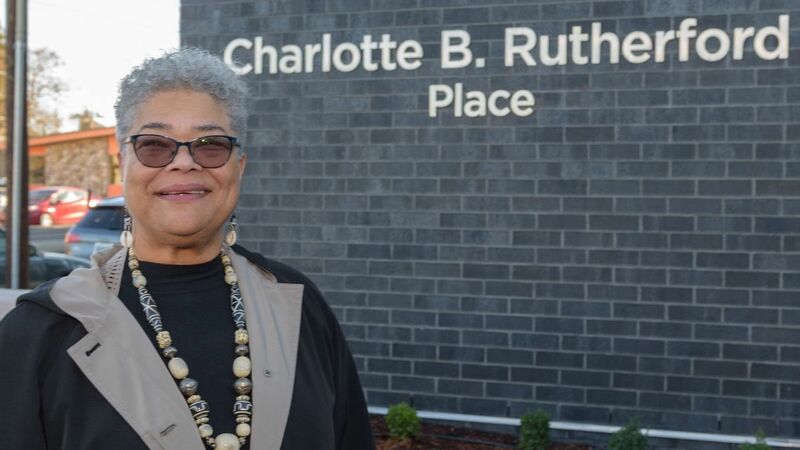 “Of course Charlotte B. Rutherford Place, nor the housing preference policy, are magic wands that we can wave to undo racial and generational traumas and injustices, but they are steps in the right direction,” she continued. Projects like Charlotte B. Rutherford Place are just the start of righting past wrongs, and no one, including Jennifer, is under the belief that these policies and projects will revert northeast and north Portland to what it once was. Now living in a neighborhood that’s simultaneously familiar and foreign, Jennifer feels invigorated by fellow Black Portlanders wrestling with the same tension. Now living in a neighborhood that’s simultaneously familiar and foreign, Jennifer feels invigorated by fellow Black Portlanders wrestling with the same tension. There’s a renewed effort, she feels, between Black Portlanders making their way back to historic neighborhoods and those who were able to remain there in the face of urban renewal projects and gentrification. She feels that there’s a buzz to regrow and reestablish a community, to connect the past to the future. At Central City Concern, we believe that one of the most immediate, tangible ways to celebrate Black History Month is to support and attend events organized by and/or featuring Black Portlanders. There are dozens of amazing events scheduled for the Portland metro area throughout February, many of which are free and appropriate for all ages! To help you easily find events you can attend, we’ve collected links to several calendars of Black History Month events. We encourage you to explore the richness of (and diversity within) Black history and culture by attending some of these events! Black History Month is a time for celebration, reflection and hope for the future. Yet as we celebrate the beautiful, vibrant and resilient Black (African-American) culture, we cannot forget the struggles Black people have endured and continue to endure today. Black people experience discrimination and racial profiling, and are disproportionately impacted by homelessness. This is why Central City Concern (CCC) invests in programs such as the Imani Center and Flip the Script to increase services to this community historically underserved by organizations that help people find housing, behavioral health services and employment opportunities. Afrocentric programs are a great start for our organization, but we know there is more we can do: not only to celebrate the history of the Black community inside and outside our organization, but also to identify and address the ways in which white supremacy drives care inequities. Recognizing our responsibility, CCC is committed to being a diverse, anti-racist, equitable and inclusive organization, with this promise reflected in our organizational leadership, as well as institutional practices and policies that promote diversity, equity and inclusion (DEI). We are stepping closer to this goal. Freda Ceaser, previously CCC’s Director of Equity and Inclusion, is now CCC’s Chief Equity Officer (CEqO). Freda leads with vision, skill and innovation to inspire and push the organization forward. She will build on her current work, setting and implementing an overarching vision of DEI—both at the programmatic and administrative levels—that promotes inclusive practices in our structures, culture and leadership. Afrocentric programs are a great start for our organization, but we know there is more we can do: not only to celebrate the history of the Black community inside and outside our organization, but also to identify and address the ways in which white supremacy drives care inequities. CCC has also made additional investments in the Office of Equity and Inclusion, hiring Associate Director Mariam Admasu to provide support to the director’s leadership team. Mariam will hire an equity specialist in the coming months to add an additional layer of support to CCC staff. In order to ensure that the Office of Equity and Inclusion has the bandwidth and resources to move work forward, we have also engaged two Portland State University School of Social Work interns, Shaun Cook and Clarice Jordan. CCC will invest as needed to follow through on our commitment to becoming more diverse, anti-racist, equitable and inclusive by building institutional infrastructure and capacity to do the work. In the coming year, CCC will work with a local consultant to capture a wide snapshot of where we are today with regard to equity and inclusion through interviews and listening sessions with CCC’s board, clients and staff. This assessment will result in an equity lens, DEI governance model and DEI organizational roadmap. Lastly, CCC’s advancing equity strategic goals were made as a roadmap to ensuring the best, most responsive services possible to Black people and people of color, with a focus on intentional efforts to have our staff reflect the communities they serve. While Black History Month presents an opportunity for CCC to celebrate Black culture, we also look ahead to the many opportunities during the remaining 11 months to make a difference! Two Building Grand Openings Provide 204 New Homes! 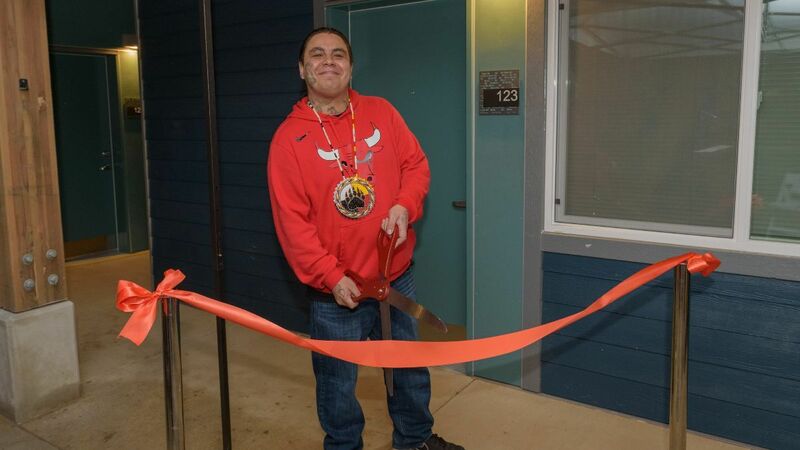 Rain, cold and a whole lot of wind didn’t dampen the joy the Central City Concern (CCC) community felt during TWO building grand openings in as many weeks. 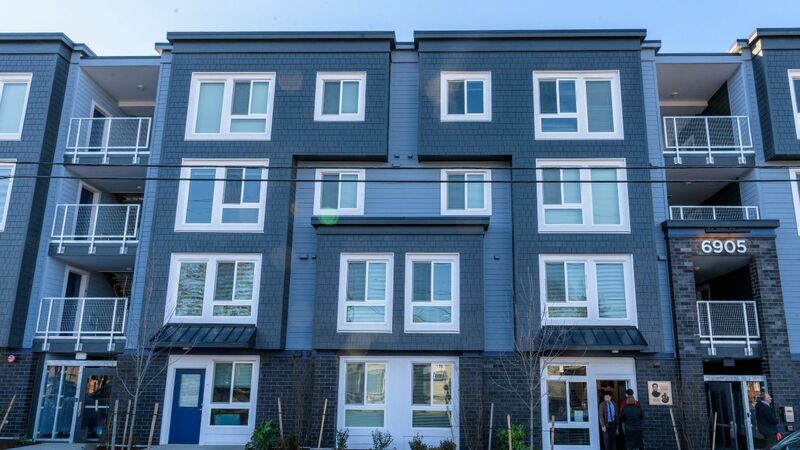 On Tuesday, Nov. 29, the soggy clouds actually parted in the afternoon as we celebrated Hazel Heights, 153 units of affordable housing on SE Stark St. at 126th Ave. The next week, on Tues., Dec. 4, a cold but sunny day, we welcomed 51 households into their new homes at Charlotte B. Rutherford Place on N Interstate Ave. 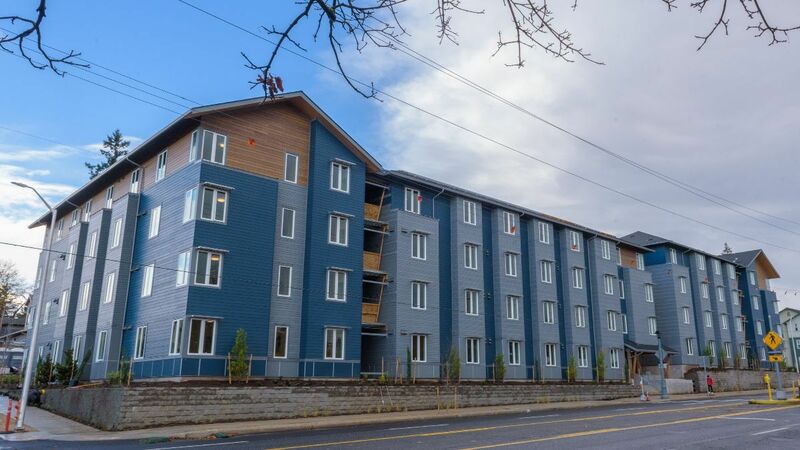 Both buildings are part of the Housing is Health initiative—a pioneering commitment from local health organizations to support the development of urgently needed affordable housing in Portland. At the Hazel Heights grand opening, Portland Mayor Ted Wheeler and Multnomah County Commissioner Jessica Vega Pederson spoke, as well as David Russell from Adventist Health Portland (a Housing is Health partner), Rilla Delorier from Umpqua Bank, Ann Melone from U.S. Bank and Margaret Salazar, director of Oregon Housing and Community Services. Before he cut the ceremonial ribbon, Hazel Heights resident Jerrod M., a single dad to three kids, expressed his gratitude that several other single dads will live in the community. He then sang a stirring honor song in his native language, Ojibwa. 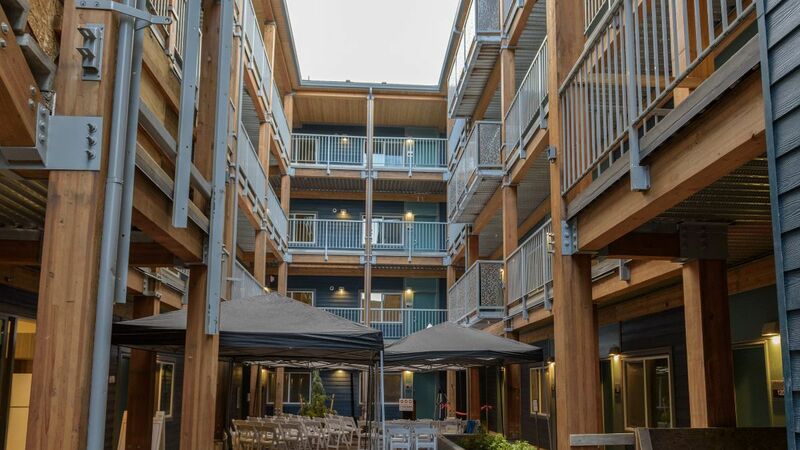 Hazel Heights will welcome people exiting transitional housing programs who have gained employment and seek a permanent home, but still may have barriers to housing. The four-story building contains 153 homes total: 92 one-bedroom and 61 two-bedroom apartments. Rents will range from $412 to $995 per month, depending on Median Family Income. These homes are important for supporting employed people with affordable housing. When people are housed, they have a better chance for a healthy future. Exactly one week later, more than 100 people gathered at Charlotte B. Rutherford Place, a 51-unit building in North Portland. One hundred percent of its new tenants are part of the Portland Housing Bureau’s N/NE Housing Strategy Preference Policy, designed to address displacement and gentrification in historically Black North and Northeast Portland neighborhoods by prioritizing long-time or displaced residents with ties to the community for new affordable housing opportunities in the area. Mayor Wheeler spoke again, along with Multnomah County Chair Deborah Kafoury, CareOregon President and CEO Eric Hunter, Cathy Danigelis from KeyBank and Latricia Tillman from Oregon Housing and Community Services’ Housing Stability Council. The ribbon cutting was a memorable one: Anthony J., a new resident who grew up in the neighborhood and is currently working hard to take full advantage of second chances, and Charlotte jointly cut the ribbon to much celebration. 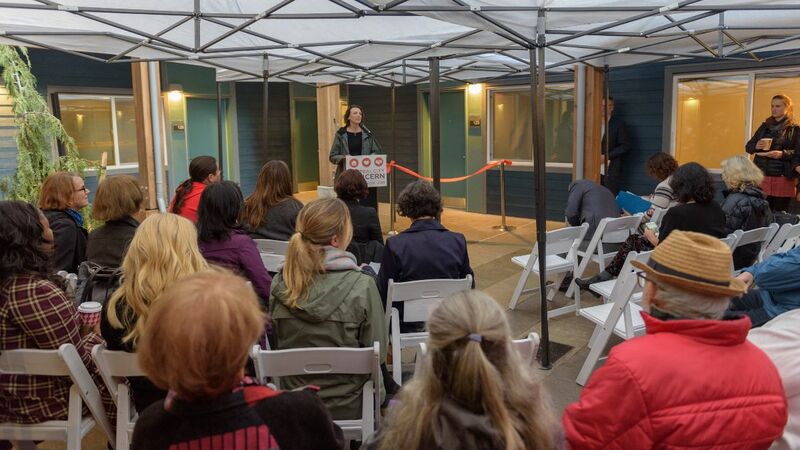 Housing is Health’s coalition of six health organizations—Adventist Health Portland, CareOregon, Kaiser Permanente Northwest, Legacy Health, OHSU and Providence Health & Services – Oregon—provided initial funding for both housing projects. Hazel Heights’ major contributors include Umpqua Bank, Portland Housing Bureau, U.S. Bank, Oregon Housing and Community Services, Federal Home Loan Bank and PGE’s Renewable Development Fund. The design and development team is Central City Concern, the architect is Ankrom Moisan and the builder is Team Construction. Charlotte B. Rutherford Place's major funders include KeyBank, Oregon Housing and Community Services, Portland Housing Bureau, Multnomah County and PGE’s Renewable Development Fund. The development team is Central City Concern and Home First Development, the architect is Doug Circosta and the builder is Silco Commercial Construction. A robust capital campaign completed funding for these two buildings, as well as Blackburn Center, opening in July 2019. This week is Trans Awareness Week, a time to raise the visibility of transgender and gender non-conforming people, and to shed light on issues the community faces. The week leads up to Trans Day of Remembrance on Tuesday, Nov. 20, a deeply important observance to honor the memory of those whose lives have been lost to anti-trans violence. During the past year, Central City Concern has moved forward in our work to ensure that our programs and services, as well as our staff members, are safe, welcoming and inclusive of our transgender and gender non-confirming clients. We’re on a journey to become the organization we’ve envisioned ourselves to be—and truly believe that we become. But that means a lot listening and learning, and of course acting, to make meaningful strides forward. Trans Diaspora of Resilience: Born out of a shared frustration with white-dominated Trans spaces, Ori Gallery is partnering with Forward Together & Sankofa Collective Northwest to bring you a night of celebrating our Transcestors, eachother and visions of a better future than the one we've been handed.